Grimes was probably the big booking of the JUE Festival, but there was no one I was more excited to see than Frank Turner. 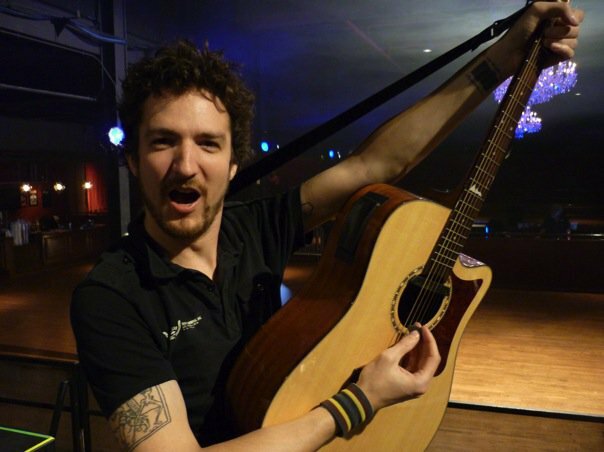 Frank Turner is an English folk and punk musician, with serious Celtic rock undertones. He’s the former frontman of a band called Million Dead but he’s been solo since 2005 and I think has really come into his own. I first saw him when he was in Shanghai about 3 years ago, and I remember being at the gig and standing next to an English guy and he said, “Have you seen Turner before?” and I said no and he said, “You’re gonna love him after this.” I rolled my eyes. I mean, everybody loves somebody and thinks they’re just the greatest. But he was right. Bless you, anonymous English dude I never ran into again. You were right. I was especially looking forward to Turner this time because he was here with his band The Sleeping Souls — a really subdued name for a band that was anything but. And apparently Turner is somewhat famous in England now because he played at either the opening ceremonies or closing ceremonies of the London Olympics. I don’t really care enough to Google that for you (journalism!! ); just take my word for it. He’s super famous and stuff. The show was fantastic. I’ll just flat out say it. Turner writes these incredibly upbeat, anthem-esque songs with really catchy hooks and melodies. Plus, his lyrics will break your heart. More than break your heart. His lyrics as so poignant they will absolutely pulverize not just your heart but many other of your internal organs. Be warned. But he also writes a lot of songs that are very nationalistic (definitely not in 1930s Germany kind of way, or should I say 1960s China kind of way, hmmm? ), but more in a homesick kind of way, about England. Jeez, my family hasn’t been English for several generations but when I hear this music I think, “To the motherland! !” I mean, he’s got a song about rivers that absolutely slays me. Rivers! Ugh. So good. And since his songs are often so easy to sing along to, you’re just asking for a bunch of homesick foreigners to show up and sing every single lyric with you. And that’s what happened. I love when people do this. I know it drives some people up the wall because we aren’t paying to hear you sing; we’re paying to hear him. But I feel like the joy in a live show comes from so many different factors, one of the biggest being how involved the audience is. And in my opinion, this is why Frank Turner had the best show of the JUE festival — because the audience was packed with people who were so into him and not afraid to show it. At general admission gigs likes this, there’s always a few guys who will hoist their girlfriends up on their shoulders so that the girls can have a better view. At this show, for the first time ever, I saw guys hoist guys onto their shoulders for a better view. That’s devotion, man. So Turner gave a great show, and I sang along too to every song, even though I’m not British (not yet anyway. One more Turner album could turn me). Incredibly energetic, well-staged and put together, fantastic musicianship, good sound from Mao and a stellar audience. It’s the best show I’ve seen in Shanghai this year for sure and probably one of my top shows ever in this town. We were so into it that during the encore when Turner asked us to sit on the floor (SIT ON THE FLOOR!!!) of Mao in preparation of a song where he wanted us all to spring up and dance on the chorus, we did it. We sat on the filthy, disease-ridden floor of Mao Livehouse with very little persuasion. Because we love him. And his music was worth it. Really happy people sitting on the floor at Mao. Not pictured: chlamydia and the swine flu, or whatever you get from sitting on the floor at Mao. Check him out if you’re so inclined. Turner is one of the few artists that I actively follow and he’s got a new album called Tape Deck Heart coming out in April.